The original Scribblenauts made a splash on the DS gaming scene by allowing gamers to conjure almost anything out of thin air. Thanks to a vast database of nouns and the use of jointed sprites, people could type in a word and see an item materialize before them. 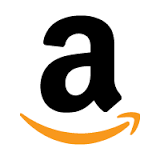 Was there a portion of the game level you couldn’t reach? Well, you could type in LADDER and a ladder would appear, just in case you wanted to prove to everyone that were boring and pedantic. Typing in WINGS was a bit of an improvement, since you could attach these to you character and just fly where you needed to go. Or you could type PEGASUS and ride a flying horse. The only limit was your imagination. This immensely appealing gameplay was placed at the service of a pretty good puzzle/arcade platformer. There were some things to fight, but most of the gameplay was centered upon collecting stars by solving problems or getting access to hard-to-reach areas. Super Scribblenauts has expanded and improved this gameplay in a number of ways, though not all are sure to appeal to fans of the original. The most notable change is the addition of adjectives to the game database. Now, instead of just conjuring a VAMPIRE, you can conjure a GIANT vampire, or perhaps a RED VAMPIRE or even a GIANT RED VAMPIRE. You don’t just have to ride a flying pig to reach that higher lever: now you can ride a BIG POLKADOT FLYING PIG. 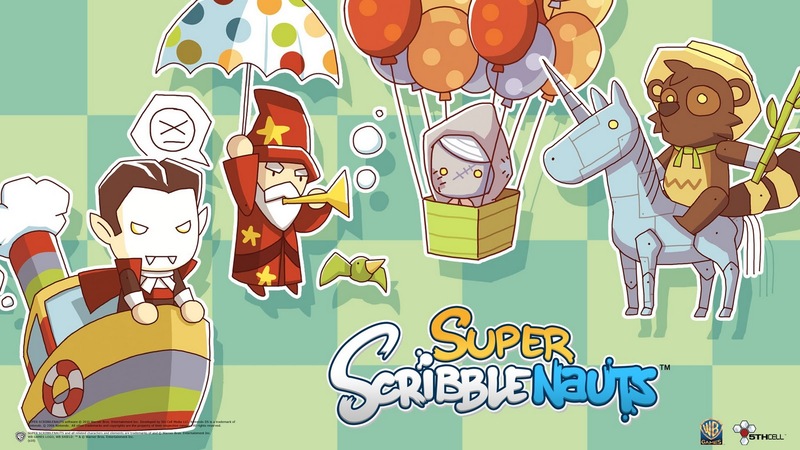 The folks at 5th Cell, who also gave us the original Scribblenauts and Drawn to Life, have used this adjectival bounty to reshape the gameplay a bit. The original game tended to suffer from JETPACK/WINGS syndrome, in which people just banged through puzzles by typing in the same couple of objects over and over again. 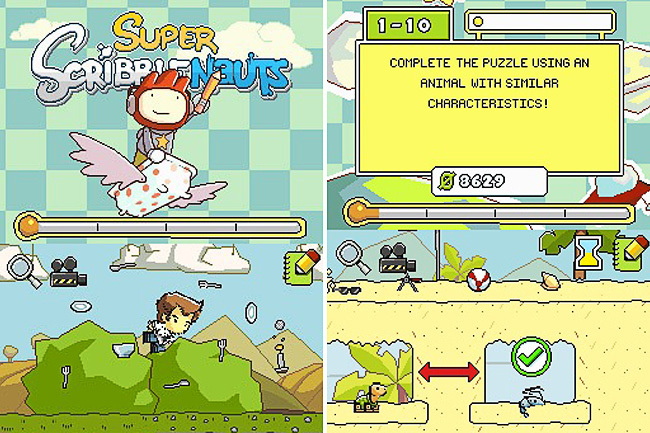 Super Scribblenauts focuses on more structured puzzles that require more precise nouns and adjectives to solve. It may be as simple as making a red key for a red lock, or creating a sequence of animals with long necks. This leads to some awkward word fishing, as you try to read the minds of the designers to come up with the word DIETICIAN rather than HEALTH TEACHER, but an in-game hint system makes these problems minimal. Fans of the original might not like that the game is less freewheeling, but the invidual puzzles are simply better with more structure. And there’s still a sandbox mode in which you can pit CTHULHU against HUGE SANTA and see who wins. That’s good, because I like to get two mismatched enemies fighting and then use a catapult to fling DIRTY ANGRY PEASANTS and PUDDING at them. The knowledge that a game can do such things should be all the recommendation you need. Skycat has a lot going for it, which is why some if its flaws are so disappointing. This is a running platformer in the Canabalt family, but with a greater degree of control and style than most run-to-the-right games. The action follows the adventures of an adorable little cat with as he runs through a fluffy cloud land filled with stars, his magical scarf flapping in the breeze as it gives him wonderful powers to leap and dash. And yet I can not only write that sentence, but admit that I enjoyed the setting and the game without any concern that people might question my masculinity. That’s because Skycat is just that damn cute. Skycat has a couple of controls, and even after finished the game I’m still not sure I can explain how they work together. There is a simple jump button that allows him to, well … jump. But there’s also a slash-gesture input that gives him a dash in the direction of the slash: vertical, straight, or down. 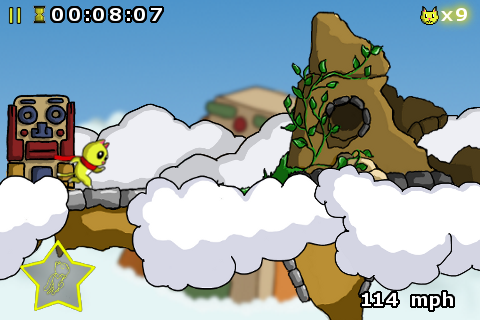 Vertical increases his leaps, dash increases his forward speed (usually as a forward tumble), and down slows his momentum. Used together, they allow you to more precise control over the running speed and leaping distance. The problem lies in the screen size, which is a bit too small for Skycat’s grand ambitions. It’s far too easy to loose track of either the upper or lower reaches of a level, meaning that you need to feel your way through each level, failing along the way, until you really have a sense of its layout. I’ve said it before, and I’ll say it again: any game that requires you to fail in order to understand the nature of its environment and challenges is fundamentally flawed. The other problem is that Skycat is short. I mean, really really short: 9 levels lasting about 45 second each. Since you can’t solve these levels in a single pass (see previous paragraph) it takes longer to finish the game, but that’s just not enough content. People keep lumping this one in with Robot Unicorn Attack, but there’s no contest: Skycat is far better. It’s also shorter. On other platforms, that would be a deal-breaker, but that’s not the case with apps which a) only cost a $1 on average and b) usually get free content updates. I liked Skycat’s visuals and controls enough to overcome some pretty serious problems, but I’d like to see it evolve a bit and address some of these issues. Until then, it’s a still a nice diversion for a buck.